The Nigerian born-Oslo based artist Sampeace Brown has been a familiar name in the music market for the past two and half decades. An exponent in mixing- pop, soul, r&b, funk, w.african hilfe and reggae in his style of music otherwise known as fusion. And does this in all effort to retain his W.African roots and musical identity. 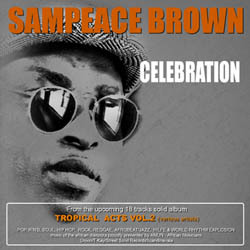 This incredible music concept and style is demonstrated on this fantastic and well galvanized single “Celebration”, being his contribution to the upcoming 18 tracks solid album “ TROPICAL ACTS VOL.2”. “Celebration” has all it takes to be heard by public, interms of solid groove, catchy with good hooks. AMUN- African Musicians Union’s mission is to create a better working environment for active performing artists and musicians of african diaspora living and working in Norway, as well as act as a bridge to the society at large. AMUN believes that through exposing the works of these local artists together with their well established international counterparts, would elevate the quality of their works same time instill some sense of belonging within the new generation multi- cultural artists in Norway. This would also enhanse the on going process of cultural intergration. AMUN believes that music speaks a universal language that does not distinguish between colour, creed nor gender. AMUN is therefore proud to present this upcoming 18 tracker edition - music of the African diaspora. For further contacts: AMUN- African Musicians Union in Norway. Att: Sam U GeorgE., Omari.S.Tabu Tel: 47 11 39 96. For arist contact: T-kay/Street Solid records Scandinavia. Contact pers. : Sam U GeorgE. AMUN-African Musicians Union in Norway is the sole organizer and arranger of “Midsomer international Music festival” and plans to hold this years event at later part of 2007 in Oslo.